Enjoy the ride of your life on the "Whistle Stop Limited". Our private train cars were built at the turn of the century and their historic past services include dining and railroad executive cars. Train travel has always held a sense of romance for those who choose to "ride the rails". Perhaps the greatest joy is having time for yourselves. Suspended in your cocoon you can soak in the whirlpool, enjoy some popcorn and a movie, read a book or just lie back and let the train gently rock your cares away. Experience the grandeur of the Victorian Era when you step inside the house and see the quality workmanship and restoration. Beautiful oak woodwork and turn-of-the-century antiques grace the interior. Whether staying in the house, built in 1903, or in one of the authentic railroad cars, whether a railroad buff, a lover of antiques or just someone who enjoys the unusual, this place if for you. 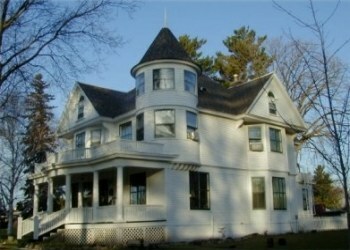 The Inn sits on an acre of land, nestled among towering 150 year old pine and oak trees. Whether you're planning a business trip, a honeymoon, a slumber party, observing an anniversary, or just an "escape" from the ordinary, the Whistle Stop is at your service. And don't forget your "Golden Spike" at the end of your memorable stay! 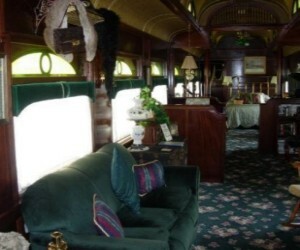 Built in 1909 as a club dining car, used by the Northern Pacific R.R. until the 1960's. Given to a retiring railroad man who worked at the tie factory in Brainerd who used it (or MISused it) for a storage shed until the roof gave way. After a full year of non-stop expenditures (labor and dollars) we have restored it to its' original opulence and now it's yours to enjoy.